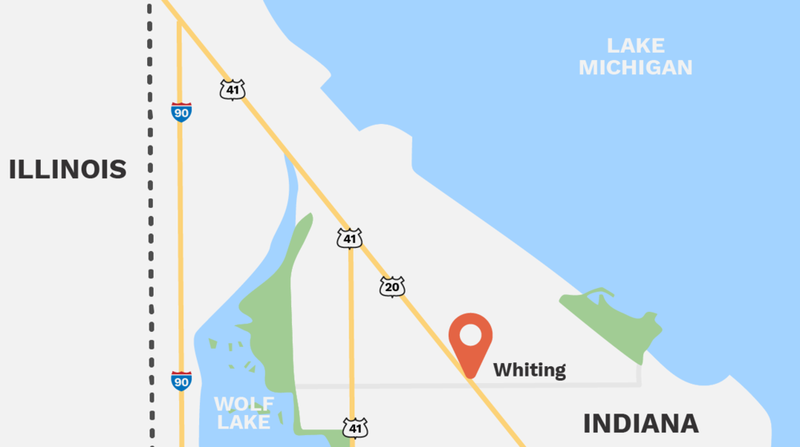 takes place in Whiting, Indiana, a friendly city along Lake Michigan. On October 13, Whiting is being overrun by creepy clowns and circus freaks. Scroll to learn more about how to get to wicked in Whiting this October. FROM THE LOOP South on I-94/Dan Ryan Expressway to the Chicago Skyway/I-90. Exit Indianapolis Blvd. Turn left at the stop light (Southeast) onto Indianapolis Blvd. and drive for approximately 2 miles. At 119th Street, you have arrived at Wickedly. Park and enjoy! FROM I-80/94 Exit Calumet Avenue North. Continue North for approximately 7.5 miles to 119th Street. Turn right (East). In about a half mile, you’ll run into Wickedly. FROM THE INDIANA TOLL ROAD, I-90 Exit Calumet Avenue North. Continue North for approximately 7.5 miles to 119th Street. Turn right (East). In about a half mile, you’ll run into Wickedly. FROM I-65 Take I-65 North to I-80/94 West. Exit Calumet Avenue North. Continue North for approximately 7.5 miles to 119th Street. Turn right (East). In about a half mile, you’ll run into Wickedly. FROM ILLINOIS SOUTH AND SUBURBS Take I-294 South to I-80/94 East to Indiana. Exit Calumet Avenue North. Continue North for approximately 7.5 miles to 119th Street. Turn right (East). In about a half mile, you’ll reach Wickedly.